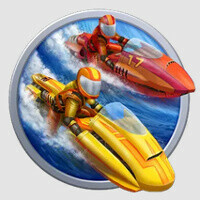 Riptide GP2, the sequel to the well-known racer Riptide, has just arrived on Android’s Google Play and it is expected to land on Apple’s App Store tomorrow. Riptide GP2 brings a set of new jets and allows you to pump up your adrenaline against real opponents in online multiplayer races. You can also upgrade your jet and its rider, and the graphics are now even better. You can race your hover jet in either multiplayer or single player where there is a brand new and more engaging career mode. You get to partake in Race, Hot Lap, Elimination, and Freestyle events to gain XP and progress. You can get the game for $2.99 on Android right now at the source link below. Wow, the game is looking good, nice graphics.